Sprucing up my space at Stars. . . and for now the bed is gone! 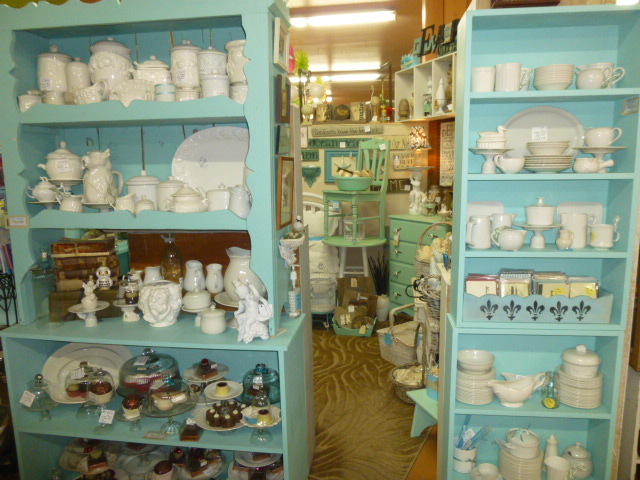 This is the view looking into the booth from the backside, the dresser is now where the bed was. I LOVED how the bed looked. And everyone who saw it did too! I got TONS of compliments on the bed. Alas, it was ‘just a prop’ and not a piece that was for sale; so I just could not justify letting it take up that much floor space for long periods of time. While it was there, the bed DID ‘earn it’s keep’ though. 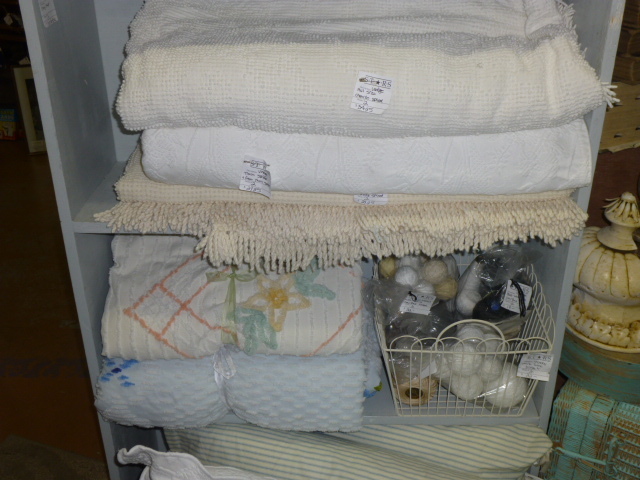 I sold three chenille bedspreads, one of the net canopys, and one pillow. I’m sure I’ll bring it back in from time to time, but I was starting to feel a little claustrophobic with so little room to walk in the booth. Now there’s room for 2 or 3 people in the booth at the same time! I did leave the chenille spreads and pillows in the booth, for now at least. 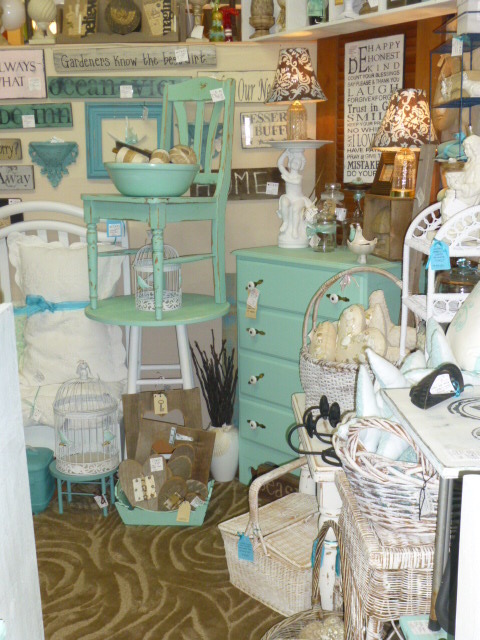 Testing to see if they will still sell well without being displayed on a bed. 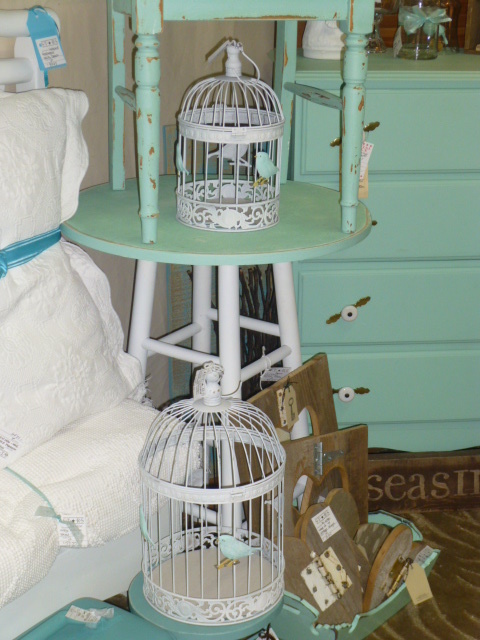 Put some on a shelf, with an old baby bassinet on the bottom filled with the big bed pillows. And one of the chenille spreads (the really HEAVY one!) 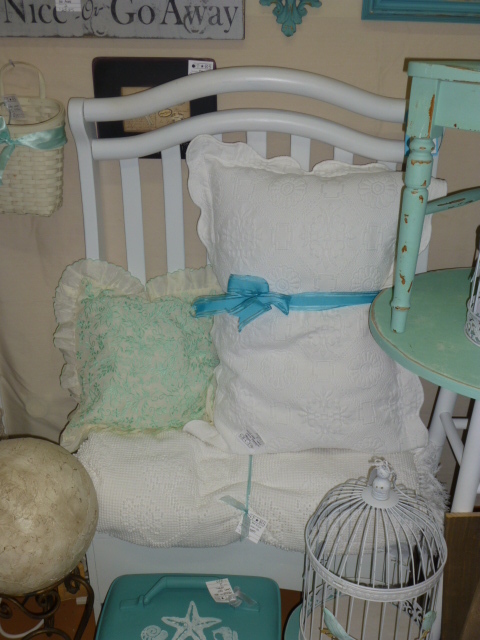 and a couple of pillows on the white high back bench. This space doesn’t NEED lamps as much as my former space did, being more open and directly beneath an over a ceiling light. 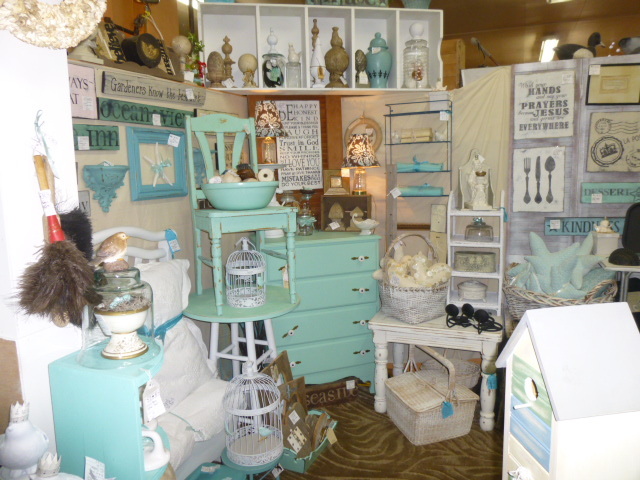 BUT I still have several lamps that I need to sell, and with the bed taking up so much space, I didn’t have room for other furniture that I could set the lamps on. Only managed to create space for these two for now. Will work on creating space for the rest of the lamps over the next few weeks. 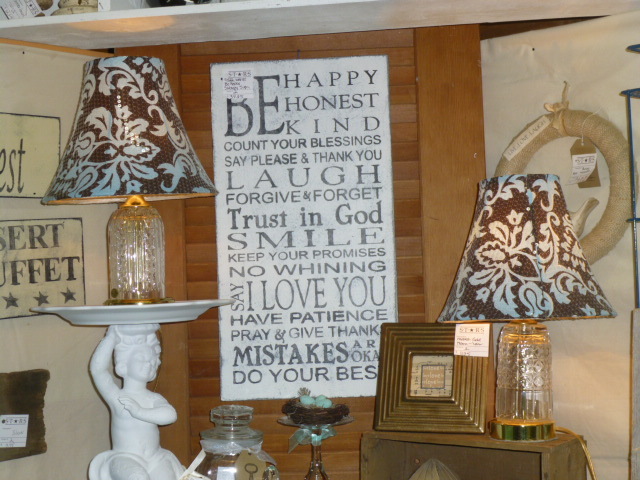 Even if you don’t NEED lamps in your space for lighting purposes, they really add a lot of warmth to your space and help draw customers in. I also brought in a little upcycled bistro table. (an old wood bar stool base and plywood top). And a chair to go with the table. Had hoped to have room to put the chair on the floor. 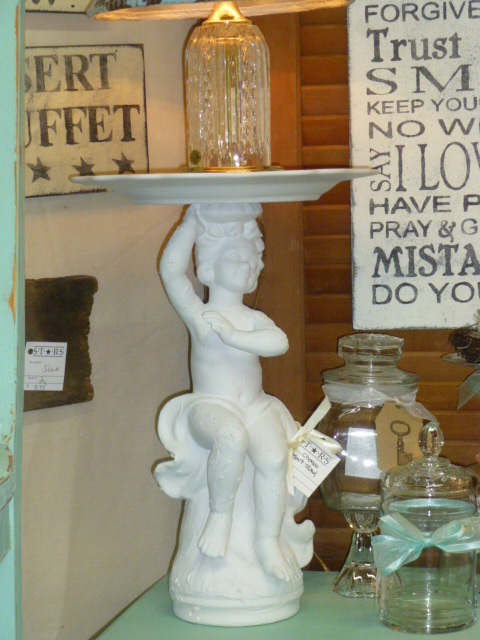 Atop a table is always an option when space is limited though. 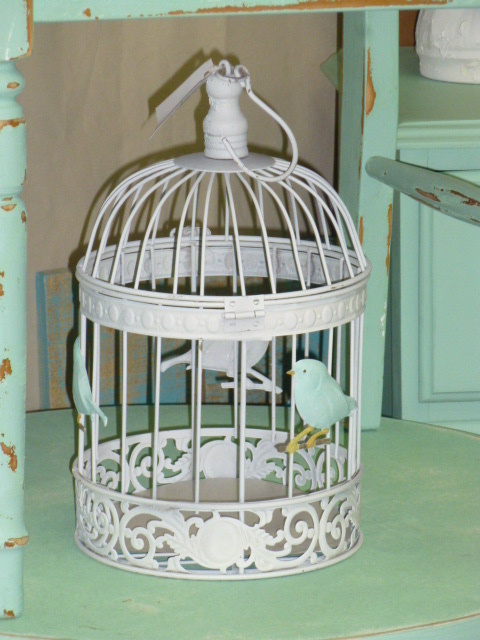 Brought he white bird cages in, 2 sizes. 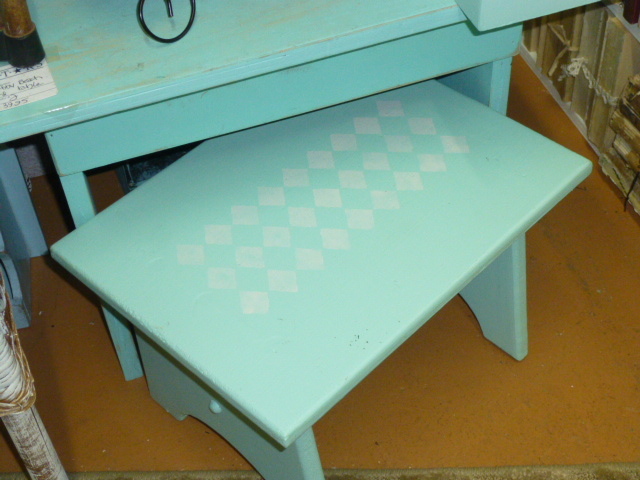 A newly repainted foot stool, with a stenciled design on the top. Moved the stack of benches to the outside end spot where the dresser had been. Will be changing that up again soon by moving a bigger display shelf to that spot; which will be ‘back to back’ to a shelf on the inside. That will give me a little more space INside the booth. At that point, the entire outside of the booth will be lined with permanent (as in not for sale) shelving. Walking UP the aisle from the front of the store, this is wat you see first, starting on the left. 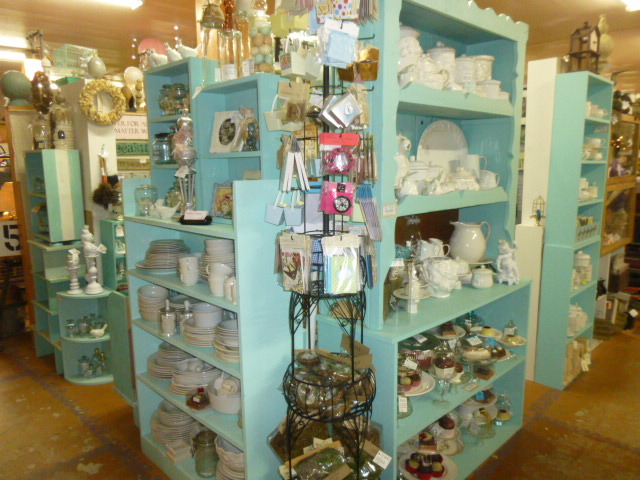 Tall skinny shelf – opening – big hutch. 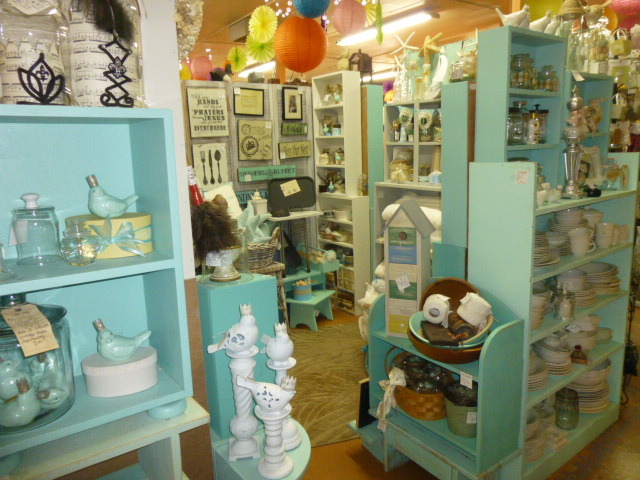 Rounding the corner (this booth is a back end cap, open on two sides) is another big aqua shelf. With Michael’s help I just made a ‘hutch top’ for this shelf, and will be adding that soon and taking the two smaller shelves off the top. I COULD have butted these shelves right up against each other at that corner, but couldn’t think of any place else to put this tall skinny spinner rack filled with smalls. 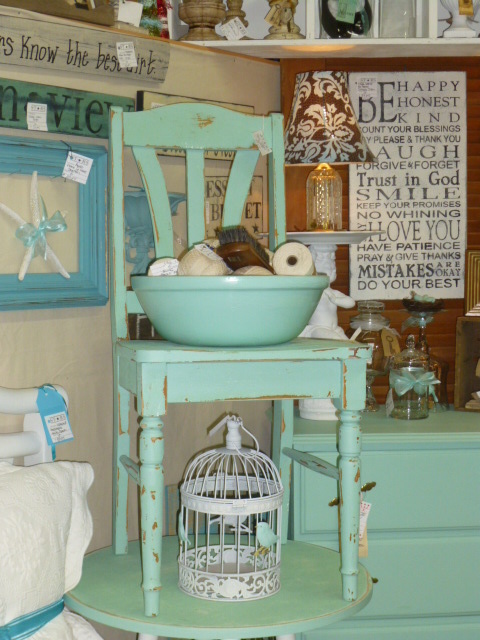 A small bench with a little hutch on top is alongside that big outward facing shelf, and flanks the other opening. The far left is where the dressed USED to be; and the stack of benches is now. 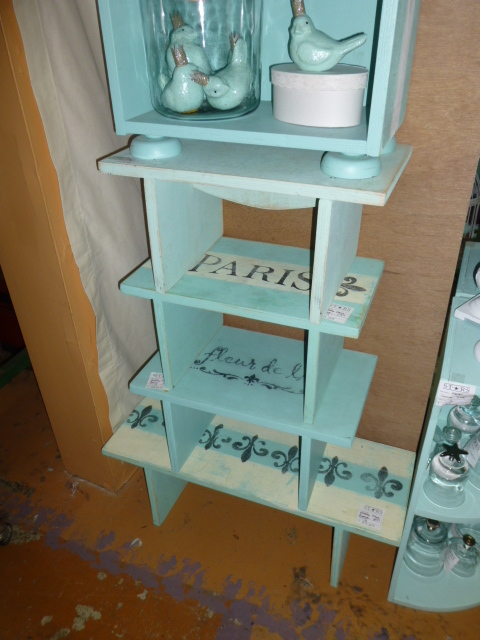 And where the other tall aqua shelf will eventually go! My ultimate goal is to have all the outer facing shelves be ‘permanent display shelves’. 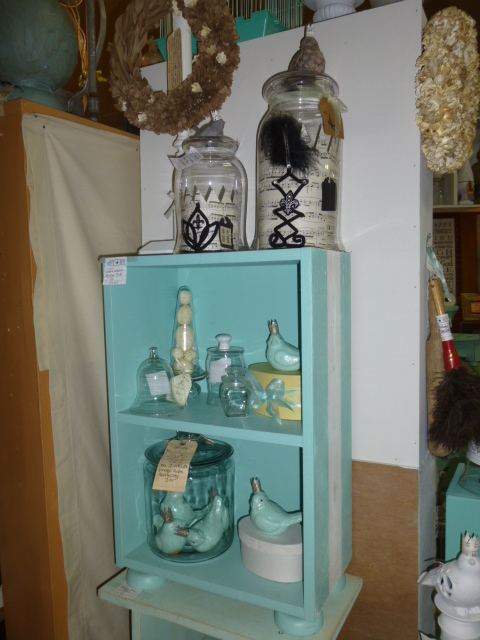 Not that I couldn’t sell these shelves, but I don’t WANT to. With the quantity of ‘smalls’ that I stock my space with, it would be an absolute nightmare to unload those shelves if the did sell! So then the smaller shelves that ARE for sale will be on the INside of the booth; and hopefully that logic will evident to the shoppers. The Stars staff is very good about explaining those kinds of things to shoppers. AND I do put ‘not for sale’ tags on the display only shelves. 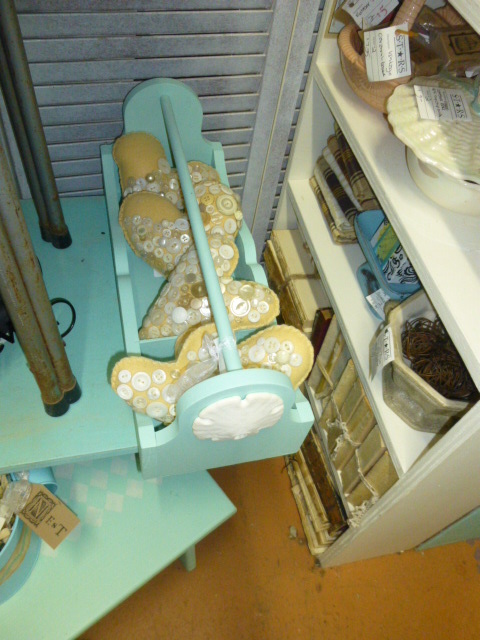 But it’s mostly the smaller shelves that shoppers inquire about buying anyhow. 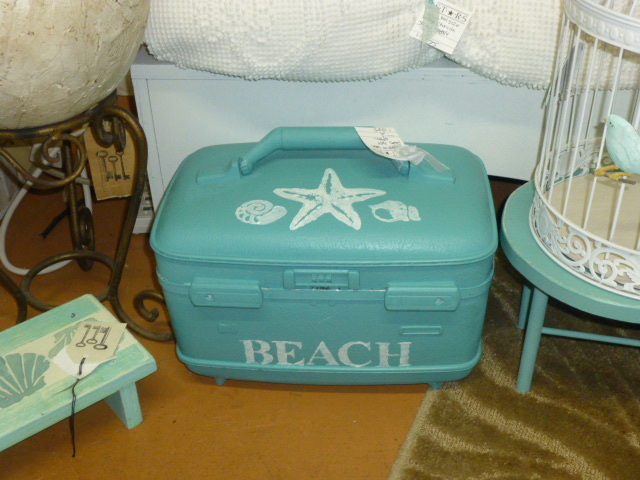 A three compartment aqua trug embellished with sand dollars. 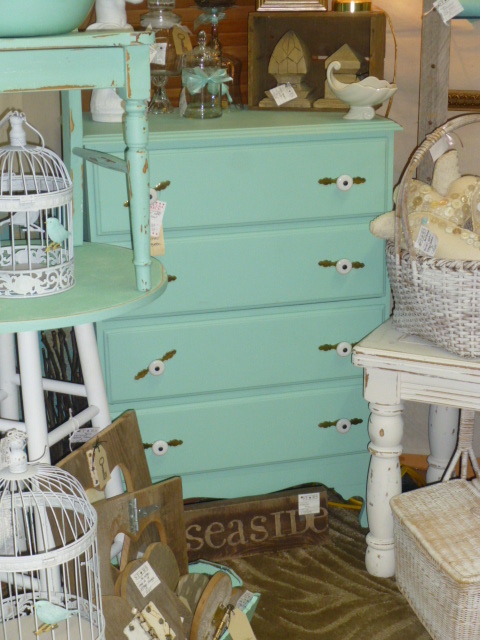 Hopefully, now that the furniture is more accessible, it will start selling better.